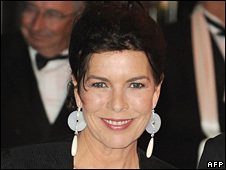 A German court has fined Princess Caroline of Monaco's husband 200,000 euros (£181,200; $270,000) for assaulting a hotelier in Kenya in 2000. 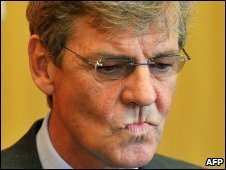 Prince Ernst August of Hanover, 56, was found guilty at an earlier trial in 2004 of causing serious bodily harm and was fined 445,000 euros. But he was granted a new trial over the incident on Lamu Island after appealing against his conviction. Kenyan authorities did not arrest him but the case was pursued in Germany. On Tuesday, a judge in the town of Hildesheim fined the prince the equivalent of 40 days of his salary, which the court put at 5,000 euros daily. At the earlier trial, the court ruled that the prince had repeatedly hit hotel owner Josef Brunlehner, a German national, with a metal object after becoming angry at the noise and laser show from the hotel disco. The prince and his wife had maintained he only gave the man two "symbolic slaps" - "one for the music and one for the lights". The prince had sought a complete acquittal but was convicted of causing actual bodily harm. "The court was not in a position to be able to decide between the two versions," judge Andreas Schlueter said on Tuesday. "He dealt Brunlehner two powerful clips round the ear in quick succession. Not the done thing, but not unrestrainedly violent either." He added: "There is no victor here. All those involved are on the losing side." The prince is a distant relative of Britain's Queen Elizabeth II and great-grandson of the last German emperor, Wilhelm II. It was not the first time Ernst August had courted controversy. In 1998 he was fined after breaking the nose of a TV cameraman. And in 2000, he was photographed urinating outside the Turkish pavilion at the World's Fair in Hanover. The prince married Caroline, the daughter of actress Grace Kelly and Prince Rainier of Monaco, in 1999. He was not in the courtroom when the verdict was delivered. Caroline, 53, gave her evidence in mid-January.